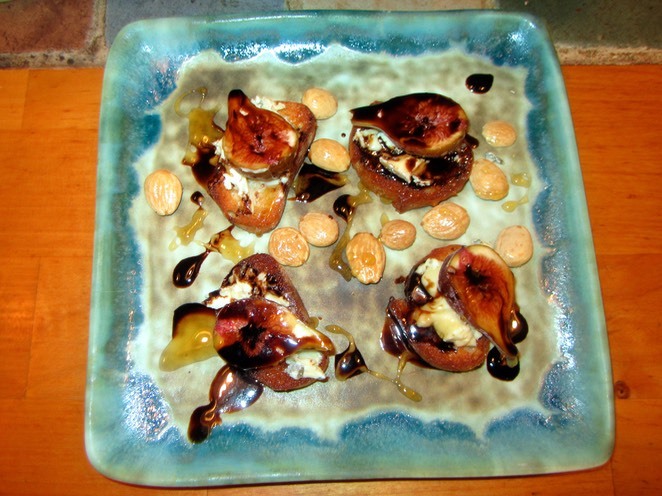 Wash figs, slice in half and set aside. Mix butter and garlic salt and brush on both sides of bread slices. Place bread on a baking sheet and bake for 10 minutes until lightly brown and crisp. Put vinegar and sugar in a small saucepan and boil over medium high heat stirring occasionally to reduce by half. This takes about five minutes and can be done ahead of time and refrigerated. We keep this around for salads and garnishes since it seems to last forever. Place four toasts each on two plates. Top each toast with a bit of cheese and a fresh fig half. Sprinkle arugula and almonds around the plate and drizzle with balsamic glaze and honey. Beautiful!